They say that Mussolini's brand of fascism made Italy's trains run on time. Meanwhile, it looks like Communists and Post-Communist autocrats made the morning subway ride in Russia something of a cultural experience. As you can see below, the Soviets designed the Moscow subway stations as underground palaces, adorned with "high ceilings, stained glass, mosaics and chandeliers." (Check out a gallery of photos here.) 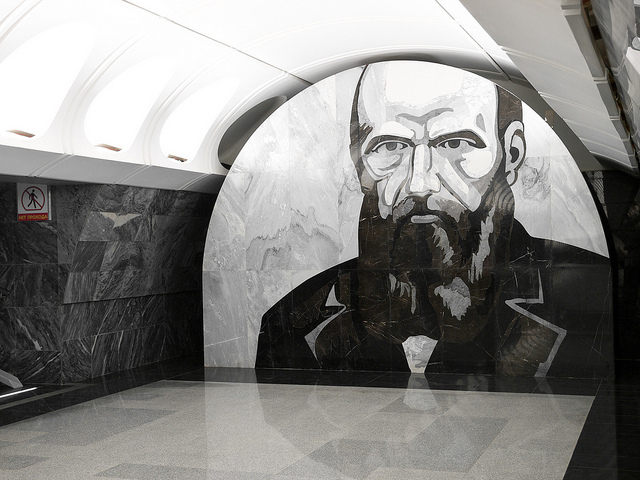 In more recent times, city planners opened the Dostoyevskaya subway station, a more austere station where you can see black and white mosaics of scenes from Fyodor Dostoevsky's novels -- Crime and Punishment, The Idiot and The Brothers Karamazov. Somewhat controversially, the mosaics depict fairly violent scenes. On one wall, The Independent writes, "Raskolnikov from Crime and Punishment brandishes an axe over the elderly pawnbroker Alyona Ivanovna and her sister, his murder victims in the novel. Near by, a character from Demons holds a pistol to his temple." Nothing like confronting murder and suicide on the morning commute. If these gloomy scenes don't sound familiar, don't fret. Late last year, the Moscow subway system launched a pilot where Moscow subway commuters, carrying smartphones and tablets, can download over 100 classic Russian works, for free. As they shuttle from one station to another, riding on subway cars equipped with free wifi, straphangers can read texts by Dostoevsky, Tolstoy, Chekhov, Pushkin, Bulgakov, Lermontov, Gogol and more. Perhaps that takes the sting out of the soaring inflation. I remember well my favorite English professor saying,”Compared to Tolstoy and Dostoevsky, every other novelist is at best third rate.” I have read most of their novels and agree. Thank you, Larry. I’m a cosmopolitan and so are these great men – still remember how Dostoyevsky (and partly Tolstoy) totally changed my perception of life as a teen. Dostoyevsky was a lot of things but he was pretty far from being a cosmopolitan. All great minds are. Of course , he was a Russian but the land he treads on & explores has no nationality.